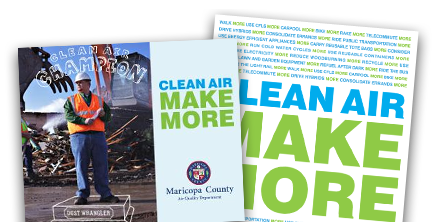 Download the Clean Air Make More toolkit including logos, website widgets, website banners and Clean Air Champion banners. 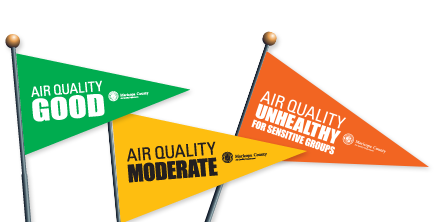 Stay informed of daily air quality conditions and fly the appropriate colored flag based on the air quality index. Download the Desktop Widget and receive real-time air quality information on your Windows or Mac desktop. 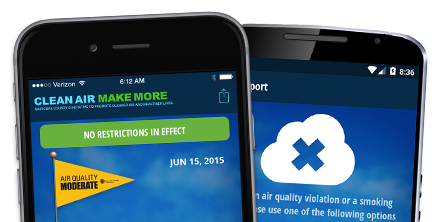 Add a Summer Ozone widget to your website to help spread the word about pollution advisories in Maricopa County. Add a No Burn widget to your website and help spread the word about woodburning restrictions in Maricopa County.